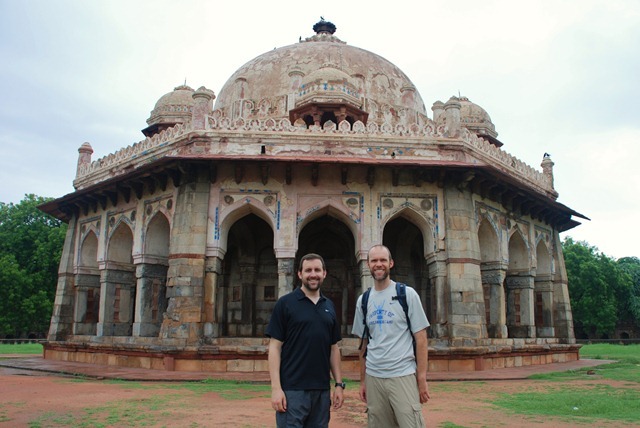 Today was our first full day in Delhi, and it started early. Our driver “Shiv” picked us up promptly at 8am (his suggestion) so we could be at the Red Fort early enough to beat the heat and the tourists. One problem, which we only found out after 20+ minutes in the car: the Red Fort isn’t open on Mondays. Doh! Shiv loses a point on that one. Detour to breakfast, which he suggested we take at the Imperial Hotel, one of Delhi’s finest. This was both good and bad. Good, because it was beautiful and near-perfect (sipping tea with businessmen and tourists of at least come considerable wealth). Bad, because this trip was not about sipping tea with business men. For those that know me, I have sipped tea as a businessman in hotels like this for 10+ years and while I love it, I’m not ready to be around it again just yet. Also, it cost just a bit less than a night in our last hotel in Kathmandu. That said, it was a nice break from the budget traveling we had grown accustom to. After breakfast it was “Gentlemen, start your sightseeing” again as we were sped off to the first of many sights, the Jama Masjid Mosque. It was beautiful, but we never actually made it inside. It was raining and the entrance was covered with water and the rules say no shoes. People were walking through the water in their socks, which was where we decided to draw the line today. Laundry comes at a premium on the road. They also wanted us to give up the backpack and pay some rupees to take pictures. We declined and took a few from the outside. 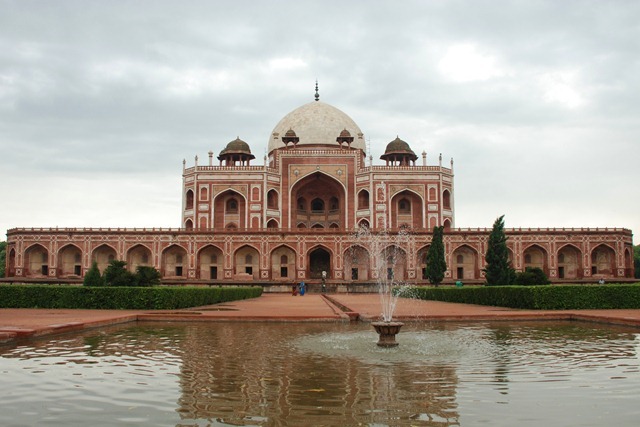 Next up was Humayun’s Tomb, a stunning set of buildings and gardens not unlike the Taj Mahal in Agra, but deep red in color Vs. white. We were early here as well and for India, you could almost say we had the place to ourselves. We even took the time to shoot a video interview on the grounds (our computer and connections have been way to slow to show the video (shot in HD – huge files), so look for that after we get home). Just when you think you have temple fatigue again, something comes along to re-impress you. Humayun’s Tomb did just that, and we were once again enjoying ourselves and snapping photos like machine gunners in battle. 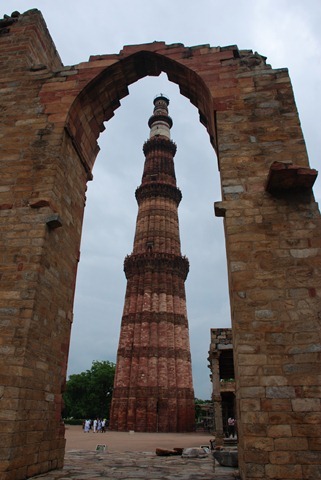 After the tomb was one of our least anticipated, but most underrated sights, Qutb Minar. Like many sights on this trip, the pictures won’t come close to doing this tower justice. Not only is it large and old, but the detail on it is simply amazing and the surrounding tombs and gardens were equally impressive. What sounded like a boring sight became probably my favorite of the day. Check out the photos section for more on this one, but also book a trip to see it yourself. Last up for sights was the Lotus Temple, a more modern structure that resembles either a) a lotus flower, or b) the Sydney Opera House. Same architect? It was quite a long drive to get there and on arrival we found it closed as well. Strike two for Shiv. Not having a good day. He was quite worried, but not us. We were quite happy to just see it from a distance because it was almost lunch time and the food here will always beat the sights (and just about everything else you can imagine). At the suggestion of my friends James and Elizabeth (who lived in Delhi for two years) we were taken to Zaffron. While expensive and expat-ish, the food was excellent! I can’t get enough of the Murgh, in just about any form, and we had two dishes of it with lunch including the Lababdar and another of the Tikka variety. Excellent! With lunch finished, we were headed back home when Ty decided he wanted a beer for the evening (our plan was to do nothing except read and/or sleep). Our driver stopped along the road near a “beer store” which was a bit odd and down-market, especially for the two travelers who had dined at the Imperial on the same morning. It was a hot, dirty place filled with the Indian equivalent of malt liquor and a generous amount of loiterers out front (even by Indian standards). Four tall cans of Kingfisher later and a brisk walk past the “very interested” crowd and we were on our way. Home at last. On a final note, I just finished a book I can’t help but recommend. Lost on Planet China, by J. Maarten Troost. If you have any curiosity about China, or even if you know it well, this book is a must read. Both Ty and I read it in just a few sittings and it is hilarious. Check it out (literally)! Oh, and don’t forget there are new photos posted!